Keeping Active Directory clean and secure is a never-ending challenge for IT teams. But worrying about what your users are changing in your critical servers or data shouldn’t be keeping you up at night. Insight-driven actions, taken at the right time, can help to identify and prevent potential attacks/leaks before the damage is done. Arming your infrastructure with a third-party auditing solution is an investment into the future security and safety of your organization. In this article, I will be casting some light on the most important things you need to audit in Active Directory to help give you peace of mind when it comes to security. 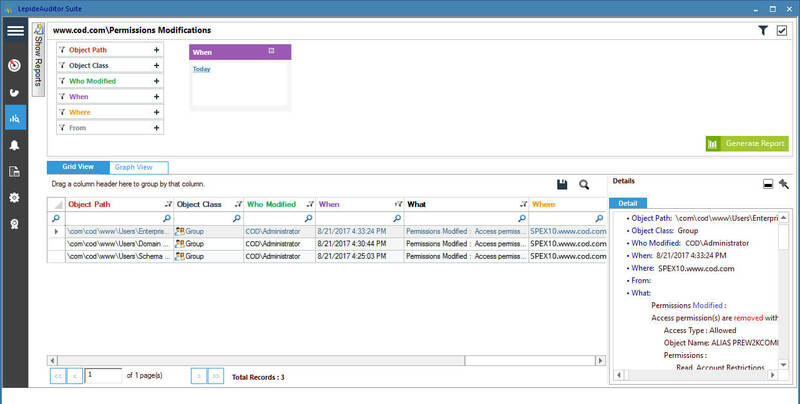 The auditing solution we will be demostrating is LepideAuditor for Active Directory. If an Active Directory account is hacked, data can be easily stolen. Sometimes, this kind of intrusion can be prevented simply by implementing strict password policies. 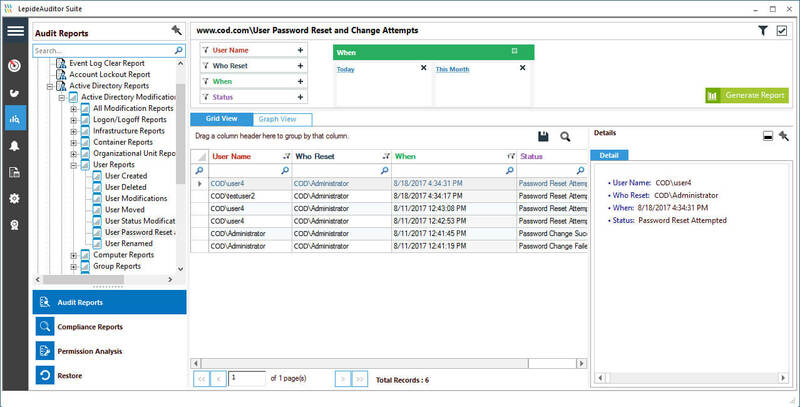 LepideAuditor audits all password reset and password change attempts so that you can ensure nothing untoward is taking place in Active Directory. Lepide’s Password Expiration Reminder lets administrators send password expiry notifications via email at regular intervals. 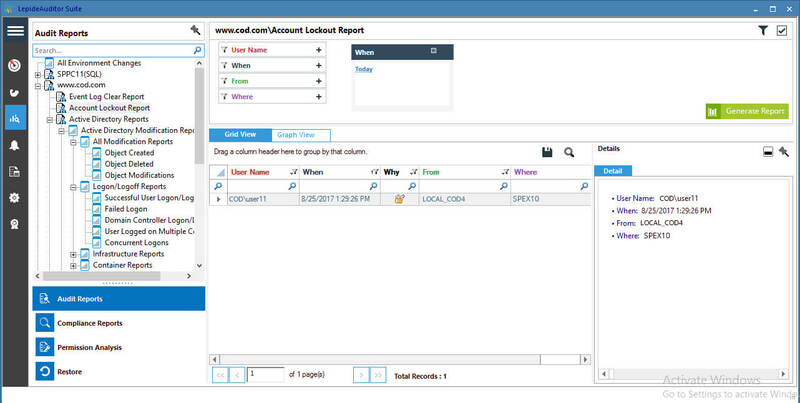 It provides predefined audit reports on password expirations and password changes – so that you can easily implement a safe password policy that your users follow. 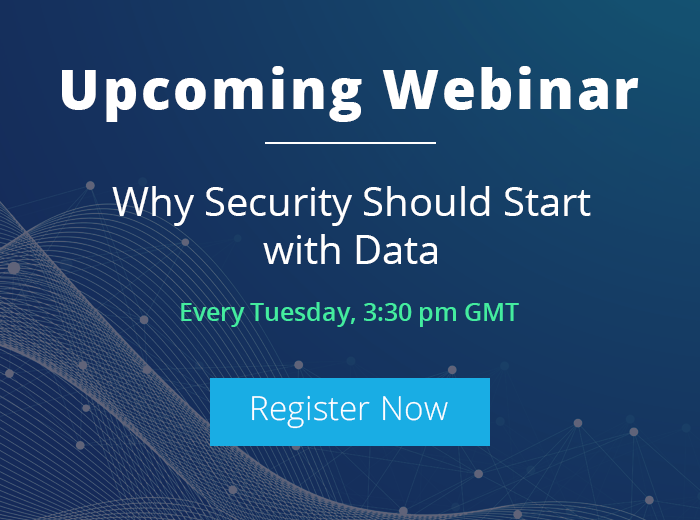 A complete history of user logon and logoff patterns will give you the power to spot trend changes that appear anomalous. Logoff patterns that break from the norm can be indicative of suspicious activity. 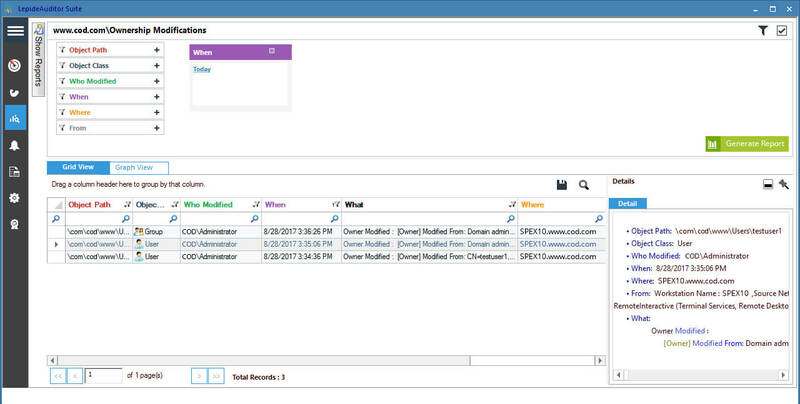 LepideAuditor enables you to pro-actively audit user logon & logoff, concurrent logons and failed logon attempts – all from a single console. 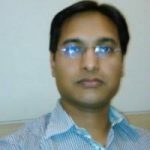 Restoring removed Active Directory objects (accidental or otherwise) is one of the most frustrating tasks that IT admins handle on a daily basis. If critical objects are deleted, you need to know immediately so that you can restore it. 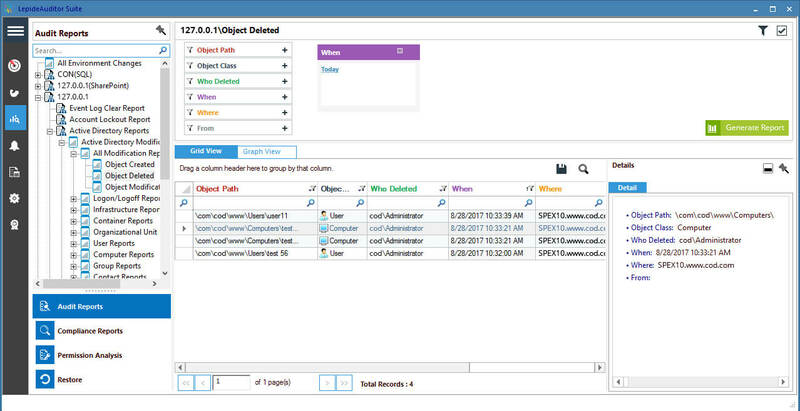 LepideAuditor provides real-time auditing of all modifications, including deleted Active Directory objects. LepideAuditor captures backup snapshots of the state of Active Directory Objects and Group Policies. The Lepide Object Restore Wizard then enables IT teams to restore Active Directory objects (even if they are not in the tombstone or “logically deleted” state). Privileged users that misuse their access rights can be incredibly hard to detect, especially if those privileges were granted authentically. 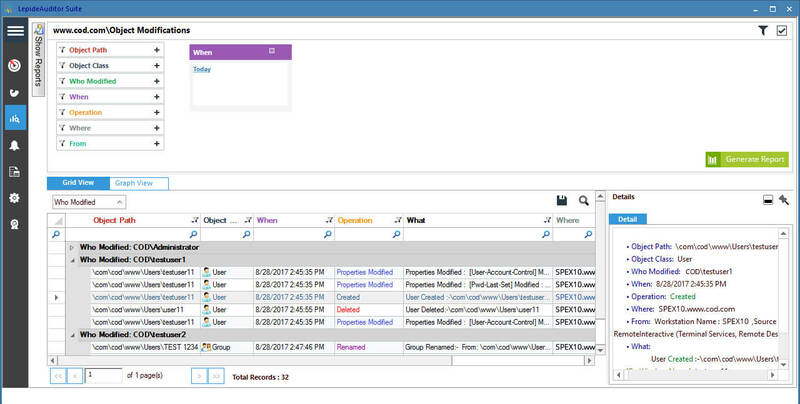 LepideAuditor monitors the activities of all users, including privileged users, in real-time and displays them in predefined reports. Real-time alerts give a snapshot of what exact changes are being made by Privileged Users in your Active Directory. Determining the reason behind an account lockout is fairly straightforward. Multiple failed logon attempts, stale credentials or stale sessions could all lead to locked accounts. However, IT teams often overlook the fact that multiple failed logon accounts could be the symptom of a brute-force attack. For this reason, it’s important to verify the cause of the account lockout before re-enabling it. LepideAuditor allows you to perform this investigation. 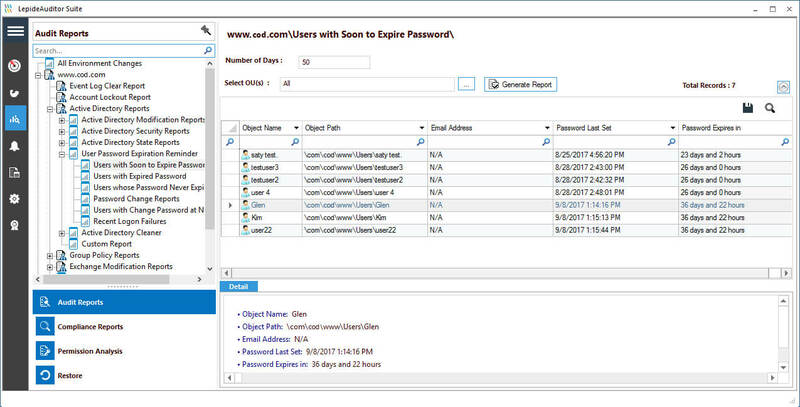 You can also investigate which other objects or activities will be affected because of a user account lockout. Dormant user and computer accounts are open invitations for hackers to gain access to your systems and data. However, these often build up unnoticed in Active Directory unless you have a solution that notifies you of their creation. 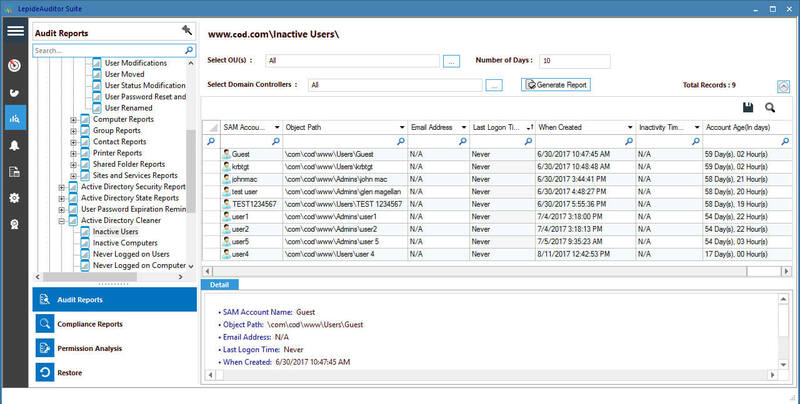 LepideAuditor offers detailed insights into all inactive users and computer accounts in your database. It lets you take automated actions against such obsolete objects – allowing you to rename them, move them to separate Organizational Unit, or delete them at predefined intervals. When looking for ways to secure your IT infrastructure, a key concept often overlooked is ownership. 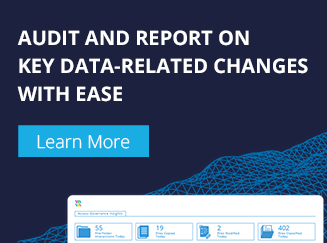 To maintain control over the entire network, security restrictions and access control of objects need to be maintained – LepideAuditor enables you to do this. 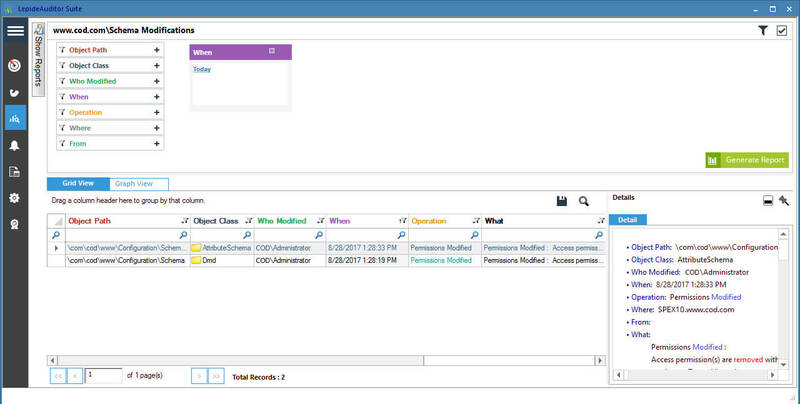 LepideAuditor also provides reports for tracking changes made in the audit settings of Active Directory objects. Securing the network assets and data whilst embracing technological upgrades are necessary to prevent data leakage or insider abuse. LepideAuditor delivers clear and detailed audit reports to this effect. 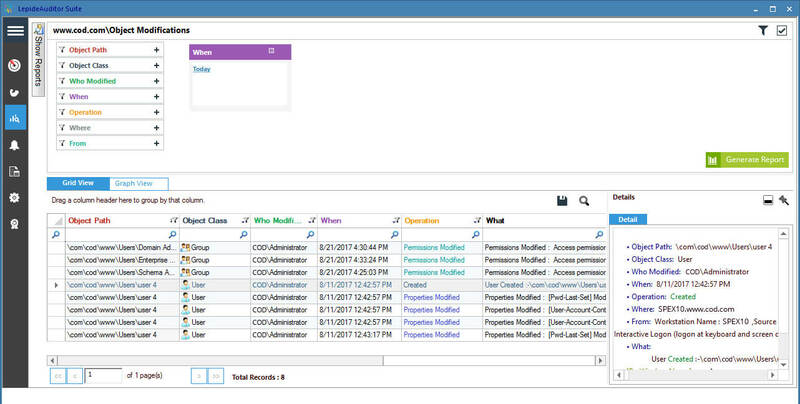 You can trial LepideAuditor for Active Directory in your IT infrastructure for free! Simply download and install it.